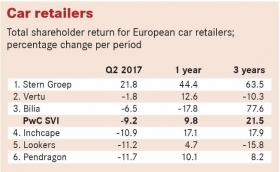 Europe's listed auto firms struggled in the second quarter. 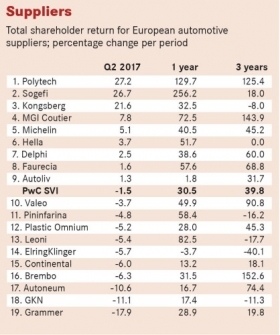 The latest Automotive News Europe/PricewaterhouseCoopers Transaction Services Shareholder Value Indices show that automakers fell by 3.8 percent, parts suppliers dipped 1.5 percent and retailers dropped 9.2 percent. 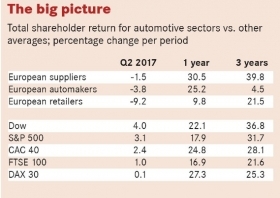 These declines in shareholder value follow three consecutive quarters of growth for all three auto industry segments. They also came during in a period where there was little movement in European stock markets, with the German DAX 30 and the UK FTSE 100 each ending the quarter within 1 percent of where they started. Renault was the only vehicle manufacturer that recorded a rise in shareholder value during the second quarter, but that gain was just 1.1 percent. Furthermore, Renault was one of the two carmakers that lost ground in Q1, when it’s shareholder value fell 3.6 percent. The Q2 decreases in value for other manufacturers ranged from 1.3 percent for BMW to 8.2 percent for Daimler and 10.0 percent for Fiat Chrysler Automobiles. The diesel-emissions scandal that began in 2015 after Volkswagen Group admitted to cheating global test continues to cast a cloud over the industry. In addition to VW Group, Daimler, Renault, PSA Group and Fiat Chrysler are all under investigation in at least one country because of emissions. In April, a U.S. federal judge in Detroit ordered VW to pay a $2.8 billion criminal penalty, bringing the U.S. costs for the automaker to about $30 billion while Mercedes-Benz parent Daimler cautioned shareholders that it could face penalties in the U.S. and elsewhere. The following month 23 prosecutors and 230 police officers raided 11 Daimler offices in Germany as part of their investigation into possible fraudulent emissions data. Also in May, U.S. authorities filed a civil complaint against Fiat Chrysler, formally accusing it fitting defeat devices to some vehicles. For investors, these concerns took the gloss off some excellent trading results. 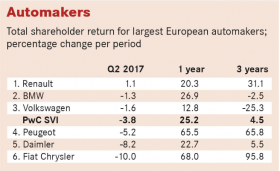 Daimler's Q1 earnings before interest and taxes, for example, almost doubled to 4 billion euros from 2.15 billion euros a year earlier. The results included a 60 percent increase in profits of the Mercedes-Benz cars unit to 2.24 billion euros and one-off gains from revaluation in stakes in mapping business HERE and its Chinese partner BAIC Motor Corp. Likewise, Fiat Chrysler turned in a better-than-expected 11 percent rise in first-quarter adjusted operating profit, which initially lifted the share price by more than 3 percent. But along with the open questions about its vehicles’ emissions, FCA announced a recall of 1.25 million pickups in North America during the second quarter. The overall decline among suppliers in Q2 may have been modest enough at 1.5 percent, but this followed three consecutive quarters of double-digit gains. Furthermore, that Q2 figure masks sharp differences in the fortunes of individual companies. Ten of the 19 companies tracked by ANE/PwC Index recorded declines in value during the quarter while six gained between 1.3 percent and 7.8 percent. Three, however, achieved gains of more than 20 percent. The big winners were test equipment maker Polytec (up 27.2 percent), filtration and suspension systems specialist Sogefi (26.7 percent) and driver controls and cable specialist Kongsberg (21.6 percent). Polytec's net profits rose 97 percent on a 13 percent growth in sales during the quarter, while Sogefi's net profits increased to 11.6 million euros from 2.9 million euros on a 12.5 percent rise in sales. At the other end of the table, the biggest declines in shareholder value came from GKN and Grammer. GKN started the quarter well, announcing plans to open a new electric drivetrain facility in China and that the automotive market was performing ahead of expectations. But its share price dropped sharply after Goldman Sachs revised its price target downward. Grammer has been locked in dispute with the Hastor family, which has built a 20 percent stake in the German automotive interiors supplier. In response Grammer has welcomed a rival auto supplier group from China, Ningbo Jifeng, as a potential white knight. Seen as a potential takeover target, Grammer's shares had risen sharply since the start of the year before relinquishing most of those gains ahead of its annual meeting on May 24, at which Hastor-backed board change proposals were defeated. For auto retailers losses in shareholder value over Q2 ranged from 1.8 percent at Vertu Motors to 11.7 percent at Pendragon. But against the general downward trend Stern Groep rose 21.8 percent, extending its Q1 growth of 14.2 percent.